If you are looking for a holiday cottage in Cromer this might be the one. Cockle Cottage is a beautifully presented conversion of a Victorian school, right in the centre of Cromer. Furnished in a Scandi style with some Mid Century vintage pieces. The beds are beautifully comfortable with nice linens. Cockle Cottage is centrally situated so all the amenities of Cromer are within walking distance. The Pier is just a short walk, as is the beach and fish and chip shop! The Cottage is in a fab location, we have not driven since we arrived and can’t believe how quiet it is considering we are in the heart of Cromer town. It is easy to see the love, care and attention to detail that Penny and Mike have lavished on Cockle Cottage. The decor is stunning. Thank you for sharing your lovely holiday home. Abby, Matt, Alexander and Frankie dog. Sitting Room: Spacious room with two comfortable sofas, side tables and lamps, selection of books. Beautiful original Meredew mid century sideboard, G-Plan coffee table. Electric wood burning effect fire, TV with Freeview, DVD player. Two windows overlooking the garden and communal garden areas. Kitchen: modern fitted kitchen with electric oven and grill, gas hob, dishwasher, large fridge freezer, microwave, toaster and washing machine. Well equipped. Iron and Ironing board, hoover and clothes airer. Dining table and chairs. Bathroom: Contemporary bathroom with large walk in shower cubicle, basin and WC. Bedroom 1: Contemporary styled bedroom with king sized bed, comfortable mattress, linens and towels provided. Small bedside chest of drawers and lamps, shelf and hanging hooks. Hairdryer. Bedroom 2: Twin room with two full size wooden single beds, linen and towels provided, bedside table and lamp. Small storage self. Internal small fully walled courtyard: with Bar stools and table. The cottage is situated right in the centre of Cromer. It forms part of a conversion of an old Victorian Board School. Some of the original architecture including the school gates are still standing. The windows and doors are all painted in the original colours of the school. 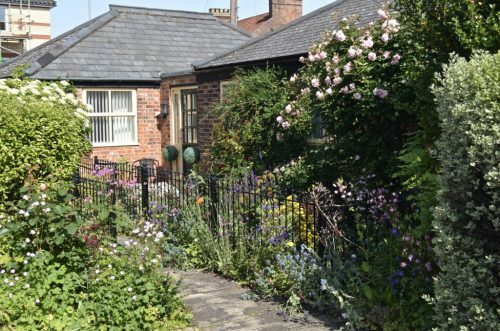 It is a pretty and historical development with a communal garden and a private fenced cottage style private garden. Cockle Cottage has its own parking space close to the property. There is a very safe and secret internal small courtyard in the property with bar stools and table so you can sit privately in the evening if you wish. To the front of the cottage is a fenced area with seating. The rest of the surrounding garden is communal with bird feeders, benches and lovely planting. The Pier and beach are just a short walk through the town. As is The famous No 1 chip shop! The cottage is dog friendly and the garden is fenced with railings. Smaller dogs may be able to get through the bars. Please check with us if you need more information.